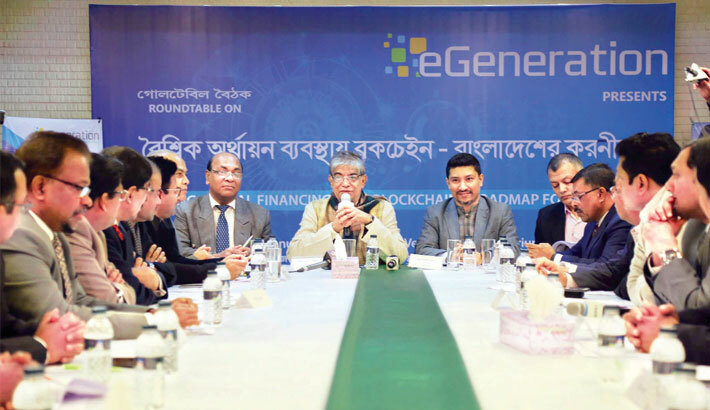 Posts, Telecommunications and Information Technology Minister Mustafa Jabbar speaks at a seminar styled “Disruption Global Financing with Block Chain – Roadman for Bangladesh” at BASIS office in the capital on Wednesday. Bangladesh has huge potential in block chain technology as the country has stepped into the world of artificial intelligence (AI) technology recently, speakers told a seminar in the city on Wednesday. Blockchain is a digitised, decentralised, public ledger of crypto currency transactions. It is safe and open method to store data. The process allows to store data in consecutive blocks, like a chain, and the data ownership is secured. Technology solution provider eGeneration organised the seminar styled ‘Disruptive Global Financing with Block chain- Roadmap for Bangladesh’ at Bangladesh Association of Software and Information Services(BASIS) office at city's Karwan Bazar area. Post, Telecom and Information Technology Minister Mustafa Jabbar attended the programme as the chief guest while eGeneration Executive Vice Chairman SM Ashraful Islam presented the keynote paper at the seminar chaired by eGeneration Chairman Shameem Ahsan. Bangladeshi firm eGeneration started developing artificial intelligence and blockchain based digital investment platform for the Dubai based fastest growing crowd funding company Smartcrowd. According to Mustafa Jabbar virtually the eGeneration is providing blockchain solutions in Dubai, sends a message to the world that Bangladesh is capable of working with such cutting edge technologies. We hope there will be more companies like eGeneration in Bangladesh working to help establish the country brand. For any such technology that is useful to general public, government will provide full support. And I would urge everyone present here to conduct proper research to identify the ways Bangladesh can be benefited from this technology so that Government can take this forward,” said the minister. Shameem Ahsan said, "It is being said that the blockchain will do to banking what the internet did to media. Disruption is coming, from healthcare and remittance to banking, real estate and venture capital. As cryptocurrency awareness spreads and investments in tokens grows, some are claiming that blockchain technology is beginning to disrupt and democratize the venture capital industry. Today, decentralized organizations are raising money from the crowd via initial coin offerings (ICO’s) and traditional companies are launching tokens and raising from the crowd via ICO’s. " Youplus Founder Shaukat Shamim said, Blockchain is the biggest revolution since internet, Bangladesh has an equal opportunity to participate in this global financial phenomenon. Ashraful Islam said, "The world is changing fast. The technology environment we lived in 2017, will change a lot in 2018. Due to open access to data, copyright protection will face a huge challenge. Blockchain will play a big role in copyright protection. There are opportunities for blockchain in land record management in our country. The fourth industrial revolution will bring a radical change in our lives. If we fail to adopt to this change, we will be fall behind. Post and Telecom Secretary Shyam Sundar Sikder, Chief Technical Officers' Forum President Tapan Kanti Sarkar, Bangladesh Association of Call Centre (BACCO)President Wahidur Rahman Sharif and Bangladesh Bank Board Director Jamal Uddin were, among others, present in the meeting. Speakers also said research and development work should be done to test the application of Blockchain technology in various sectors of our economy. The roundtable is a timely initiative to introduce the concept to various stakeholders who could play a role in establishing a vibrant ecosystem of blockchain in the country and help to compete in the global market.